Mannan Wani had been studying at the Aligarh Muslim University's department of Geology for four-five years and had chosen to specialise in Applied Geology. Srinagar: A research scholar at the Aligarh Muslim University, or AMU, who had taken a break to go home has joined the terror group Hizbul Mujahideen, a development that is seen as a setback to government efforts to persuade young Kashmiris to give up violence and return to the mainstream. The police made the discovery after Mannan Bashir Wani's photograph, holding what appeared to be a AK assault rifle, appeared on social media on Sunday. Mannan Wani had been studying at the Aligarh Muslim University's department of Geology for four-five years and had chosen to specialise in Applied Geology. The scholar said to be in his mid-twenties - enrolled in the university's Ph.D. programme, had last year won accolades for his paper on flood risk assessment in his home town in north Kashmir using remote sensing and GIS techniques. His decision to drop out and join the Hizbul Mujahideen somewhere in south Kashmir has come as a huge surprise to his friends and acquaintances. Mannan Wabni, according to the AMU website, was given the first prize for his presentation at an international conference in Bhopal in 2016. 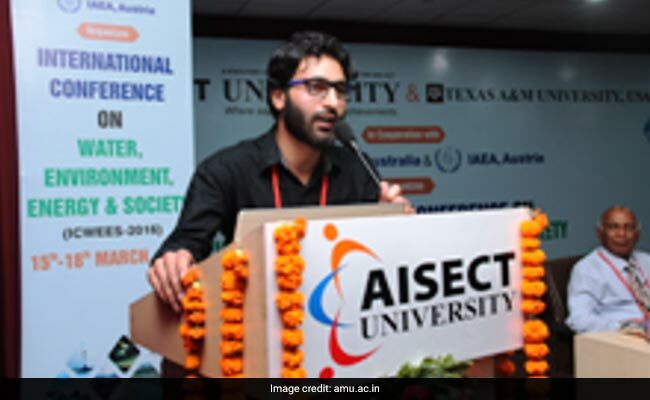 One wrote on social media how he had always expected Mannan Wani to make it to civil services, another referred to his paper that had won him the first prize at an international conference in Bhopal in 2016. It transpired that Mannan Wani had left AMU in Uttar Pradesh a few days back and reached Delhi. He was said to be on his way home in Kupwara district's Lolab Valley where his family lives. He should have been home three days back. Local media reports said his family filed a missing report after his photograph with the assault rifle emerged declaring that he had joined the terror group.